Welcome to Ezogiku's Home Page. We've finally updated official Ezogiku Hawaii's web site. We will keep updating and adding new contents in order to respond our customer demand. For now we start off with simple informative format. Hope you enjoy and find the contents useful. Thank you for your patronage at Ezogiku Royal Hawaiian branch for past 10 years! After 10 years operation at the center with much regrets and sadness Ezogiku Royal Hawaiian Center location will be closing its door on October 27, 2018 at 10pm. In order to pursue our mission, “staying a reasonably priced Ramen diner where customers can visit repeatedly at ease,” we have run at full this past 10 years. We ask our customers’ understanding. We sincerely thank you for your love for Ezogiku. Our restaurants at Perl City Shopping Center and Waimalu Shopping Center are still open as usual. We would like to sincerely ask for your continued patronage at these locations. HEARTY & HEALTHY CHOICE! Tomato, garlic hinted olive oil over chilled Shio Ramen noodle soup. Dash of lemon make it even more refreshing. Perfect to beat summer heat! 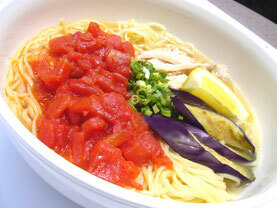 ANKAKE RAMEN IS BACK BACK POPULAR LOCAL DEMAND at WAIKIKI RHC STORE! Ankake Ramen is topped with stir fried seafood vegetables in a thick sauce. Thick sauce keeps the ingredients and ramen very warm and flavorful. Ankake is shoyu based with toppings: shrimp, squid, shiitake mushroom, pork, nappa cabbage, and carrots. It is served for limited time only at Waikiki Royal Hawaiian Center location. 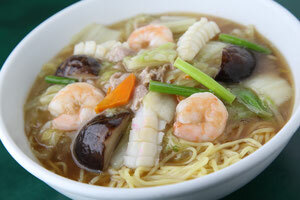 Now serving Udon noodle Pearl City, and Waimalu locations. 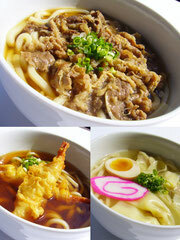 Current lineups are Beef Udon, Tempura Udon, and Shio Wonton Udon. Udon soup is made of blend of Ramen soup and katsuo dashi. Udon made by Ramen shop is worth trying! You'll taste the difference. *Pictures may differ from actual. FREE PARKING (1 hr) at WAIKIKI ROYAL HAWAIIAN CENTER LOCATION! Ezogiku @ Royal Hawaiian Center Pa'ina Lanai Food Court location can validate your parking ticket with purchase. 1 hr free parking is offered by Royal Hawaiian center and will last during this promotion.